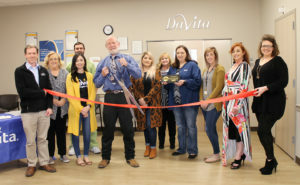 The Brownwood Area Chamber of Commerce held a ribbon cutting on Thursday, February 28th to welcome new member DaVita Brownwood. DaVita Brownwood is a provider accredited by the National Committee for Quality Assurance. They manage care for patients with late-stage chronic kidney disease and for patients with end stage renal disease who depend on life-sustaining dialysis. DaVita Brownwood partners with health systems, health plans, nephrologists and the government to measurably improve clinical outcomes, enhance patient experience and reduce total cost of care for renal populations. They are located at 2511 Crockett Drive, Brownwood. For more information, call DaVita Brownwood at (325) 646-0295, or visit their website at www.davita.com. Pictured are DaVita Brownwood staff along with the Brownwood Area Chamber board members and Ambassadors.